Why Choose Dream Dogos for your next Dogo Argentino? The universe has given us three things to make life bearable - hope, jokes, and dogs. The most precious of all is dogs. A Dogo Argentino from Dream Dogos makes that saying absolutely true. Satisfied customers nationwide. Please refer to customer reviews at BBB. Before we started our breeding program we spent years selecting and studying the best bloodlines. We only breed Dogos that have excellent temperament, strong drive to work, hunt, and are easy to train. Our Dogos are always a source of pride and joy for their owners. We provide a true health warranty. Our medical knowledge and a lifelong research career are utilized to provide comprehensive care plan including feeding instructions, skin care and all of the required supplements that are specific to the Dogo Argentino. Our care plan has been tested and tried and has proven to provide all that the Dogo Argentino puppy requires to grow healthy. Buying a Dogo from Dream Dogos does not end by receiving the puppy. We provide continuous support for our customers and their new family members. We value customer service and take extreme pride in our puppies. We provide the best customer service from start to finish. We work very hard to match the right Dogo Argentino to the family/owner. We are very proud of our breeding program and rest our reputation on your satisfaction. We have made it our policy to never disrespect another breeder. So please do not ask us about the quality of other Dogos within or outside the United States. Keeping that in mind, we also know that we breed superior Dogo Argentinos and provide excellent customer service. Whomever you choose to get your Dogo Argentino puppy from, we offer you best wishes. However, we hope you choose to become a member of the Dream Dogos family. 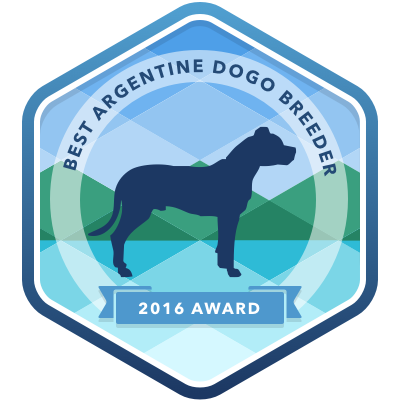 ©2016 Dream Dogos | Argentine Dogo Breeder.